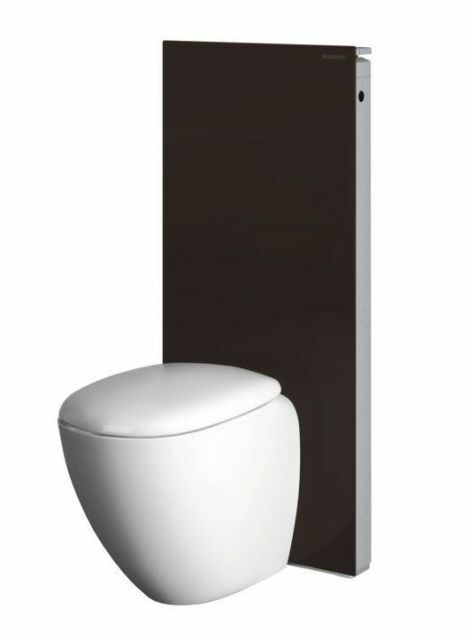 Monolith sanitary modules and accessories for floor standing WCs. For close coupled WC with 150 mm floor drainage outlet. For use in floor outlet connections. For use in wall outlet connections, outlet height 180 mm (requires 131.083.16.1). For mounting on finished floors. Not compatible for ceramic pans using metal bracketry. Sanitary module with front cladding made of toughened safety glass (ESG) and lateral cladding made of brushed aluminium. Includes a Duofix frame PreWall mounted. Height compensation up to 20 mm. Front panel made of 8 mm glass side base pods can be adjusted to skirting board.